Jane Austen is big business. Her novels, written in early nineteenth-century England, have proven remarkably adaptable to the demands of the contemporary culture industry. Andrew Davies, screenwriter of what is now surely the most famous adaptation of Pride and Prejudice (1995), has claimed that there is no-one better to adapt, thanks in no small part to Austen’s superb plotting. Characters created long before anyone thought to refer to things like ‘franchises’ or ‘transmedia storytelling’ have had their original words, thoughts and actions, as described by Austen, embellished and extrapolated across several works by other writers, many designed to satisfy readers’ desires in ways that were not possible for Austen herself. The main two characters who have received this treatment are, of course, Elizabeth Bennet and Fitzwilliam Darcy. The wisdom of contemporary transmedia storytelling is that a successful franchise will create a world that viewers/readers/users want to return to and explore time and again. Again, Austen was ahead of her time. Or rather, today’s readers want to return to her world (or a selectively-imagined version of it) because it is no longer ours. 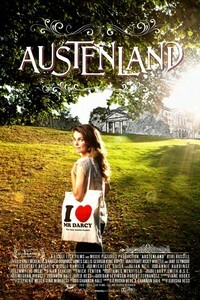 Austenland is set in one of the more extreme outposts of the Austen industry: a kind of theme park on the grounds of a stately home. For a large amount of money (the film never gives us an actual figure), one can spend a holiday in another place, and another time: a version of Regency England, where the material and technological trappings of the present are absent (more or less). One can also engage in pastimes and rituals from the pages of Austen, with handsome men paid to play their parts and cater to women’s (usually, Darcy-fuelled) fantasies. The woman we follow on her trip to Austenland is Jane, played by Keri Russell, the star of the brilliant Waitress (2007). The film’s pre-Austenland phase tells us that Jane’s Austen fixation is informed in no small part by the lack of consideration and constancy that she suffers at the hands of her male contemporaries (in this respect, as in others, Austenland resembles the more polished and precise ITV mini-serial, Lost in Austen ). The film gives us a great concept and a very good cast. As with other Austen adaptations with a twist, much pleasure can be derived from trying to figure out who will fill specific roles in Austen’s original plot architecture, and how the trick of changing things so that they can ultimately lead to the same outcome will be pulled off. Another source of significant enjoyment offered by the film is the way in which it allows the contemporary to puncture the restrictions of Austen’s world. Never before has Chris de Burgh’s "The Lady in Red," here played over a Regency ball, sounded so sensuous, free, and full of promise. What Austenland does not keep from Austen is sharp dialogue and tight plotting. This is certainly a shortcoming of the film from one perspective, making it much less acute and ‘telling’ than it might otherwise be (and, to mention it once more, than Lost in Austen was). However, as the Austen industry shows us, plot is only part of the equation; world-building is just as important. Although it is sometimes lacking in focus and forward momentum, Austenland, like Austenland, offers an experience that is at once immersive (here is a world to explore) and estranging (how can I be sure where performance ends and sincerity begins?). It is partly an achievement of the film and partly in spite of itself that it manages to be engaging, thought-provoking, and sometimes genuinely surprising. This review was published on October 08, 2013.